Boeing's chief executive officer, Jim McNerney has told reporters that the company sees renewed interest in the freighter version of the B747-8 as the global air cargo market rebounds from a prolonged slump. 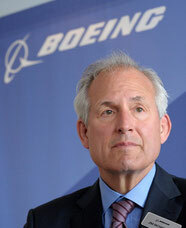 According to the Boeing executive, the new aircraft are needed because global airfreight was strongly reduced after the 2008-2009 financial crisis, with some operators going out of business and under-utilised aircraft being parked in the desert. The 747-8F is the only commercial freighter with nose-loading capabilities. Boeing currently has just 35 unfilled orders for 747s, according to its website. That’s enough to keep the assembly line going for about two years at the current pace of 18 aircraft a year. Boeing plans to slow output to 15.6 jets a year in September. Cargolux Airlines, the launch customer for the 747-8 freighter, plans to order more of the aircraft, the carrier's CEO Dirk Reich said last month.